February 7, 2019 at 4:42 pm. In a detailed blog post on Medium.com tonight, Amazon CEO Jeff Bezos reveals the National Enquirer is threatening to publish embarrassing photos of him (and his new girlfriend) unless his private investigators back off the tabloid. Bezos details alleged correspondence between the lawyer for his lead investigator, Martin Singer, and Dylan Howard, the chief content officer for AMI. Pecker has been a longtime ally of President Donald Trump. Trump, of course, has been a longtime critic of Bezos, Amazon and the Washington Post frequently targeting all three on Twitter. If there is anything here linking it back to Trump, one has to admit – messing with the richest man in the world is ballsy, even for the (theoretically) most powerful man in the world. liberty aggregator April 24, 2019 at 4:27 am. liberty aggregator April 23, 2019 at 1:20 pm. liberty aggregator April 22, 2019 at 10:00 pm. liberty aggregator April 22, 2019 at 7:07 am. liberty aggregator April 21, 2019 at 3:45 pm. liberty aggregator April 20, 2019 at 8:30 pm. liberty aggregator April 20, 2019 at 9:45 am. liberty aggregator April 19, 2019 at 6:55 pm. liberty aggregator April 19, 2019 at 3:00 am. liberty aggregator April 18, 2019 at 12:41 pm. liberty aggregator April 17, 2019 at 9:01 pm. liberty aggregator April 17, 2019 at 6:22 am. It turns out that perhaps deficits do matter. 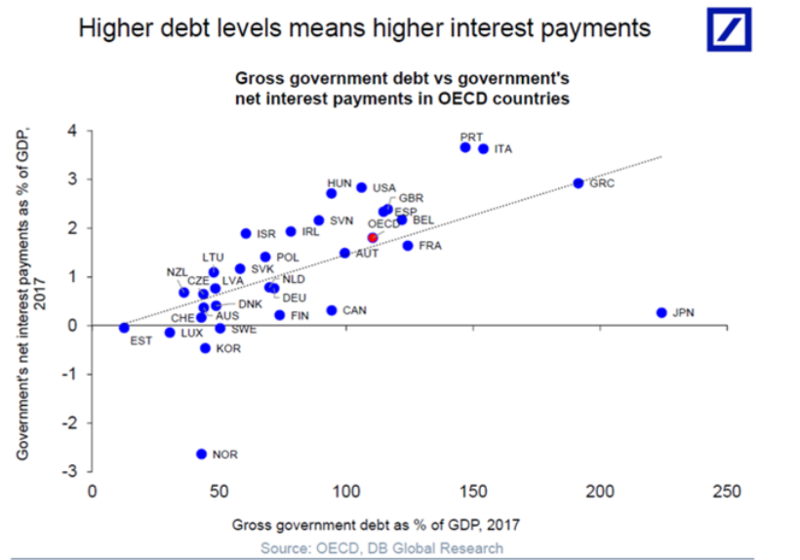 Higher debt levels do eventually lead to higher interest payments, DB research shows, via Torsten Slok.